Dan Haar: Can we return to shared values as a global beacon? 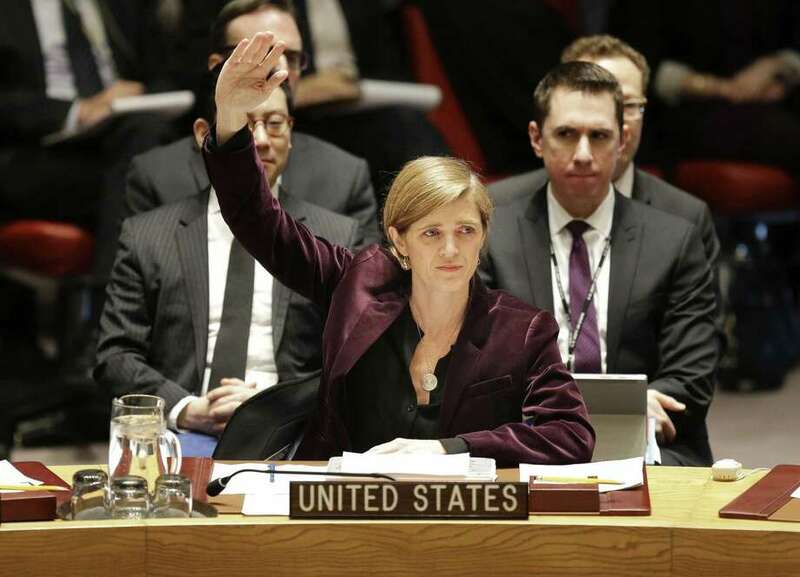 Samantha Power, United Nations ambassador under former President Barack Obama, votes for sanctions against North Korea in 2016. How much can an idled iPhone, avoidance of clickbait and a rock band of United Nations diplomats advance humanitarian values in the world? A lot, to hear Samantha Power and Julia Gillard tell it. Instead, they talked about where power really comes from — power as in influence, not the Irish-born diplomat who’s now a Harvard professor — and about personal diplomacy and, mostly, the way shared values should, but don’t always, dictate coalitions. President Donald Trump and his impulsive, sclerotic, transactional view of global politics as a matter of interests — not values — represents a sharp break from the world order these two hugely influential women helped shape. Many of us in the large crowd at The Bushnell expected to hear about Israel — Power and Obama declined to veto a U.N. resolution condemning the West Bank Settlements — and Venezuela, where a president holds power despite global scorn; the U.S. exit from the Middle East wars; and the China trade standoff. They and moderator Evan Osnos, a New Yorker writer who graduated from Greenwich High School in 1994, mostly stayed away from those hot topics, focusing instead on a more fundamental view of power. And so, for us in Connecticut, where we struggle with how to regain our economic footing amid constant bickering, it was a good reminder. The lesson is about finding shared values in a world where tensions seem very high. Trump, and more exactly, Trumpism, was the constant backdrop but these two world leaders, obviously not fans, didn’t dwell on that. “I think we can manage these tensions, but the truth is it’s going to get harder and harder,” she said, with America — read: Trump — becoming more unpredictable. Aligning with dictators and abandoning allies would fit that description. Trump either did or did not hang up on Australian Prime Minister Malcolm Turnbull eight days after Trump took office — which prompted Gillard to quip that it’s not easy for a U.S. president to pick a fight with Australia, of all nations. “What started out as jokes and humor during the campaign is now a sense of anxiety,” she said. The point is that the ideas that gave rise to Trumpism — everything is open to negotiation regardless of underlying values — are fixable with effort. That effort includes listening to people by putting away our devices — Power bans them, and laptops, from her classrooms — and by relating on a personal level. Power rose under Obama as a former journalist, Harvard-trained lawyer and humanitarian activist with more than a bit of idealism. She talked about the clash of security interests vs. values in the White House, where she was on the National Security Council before the U.N. appointment. But he wasn’t in the band called U.N. Rocks, in which Power was lead singer. And he wasn’t in the G-37 — the group of women ambassadors that she formed to unify the gender minority, modeled after a much smaller group called the G-7 (not that G7) formed by former U.N. Ambasasador Madeleine Albright. “Me and my sisters would get together,” Power said, cutting across lines of ideology, wealth and poverty and geographic alliances. We see the same examples of shared values in any political system, of course, and just as on the world stage, we miss the days when Republicans and Democrats ate and drank together at restaurants and bars around the state Capitol. Maybe it’s coming back, that way of thinking and acting. And if it does, maybe it will have some effect. The world is complicated enough that no one thinks it’s that simple anymore, certainly not Power and Gillard. Power learned a lesson about pragmatism from Obama, who, like most people in power, moved away from idealism.